Our third Chessington weekend was the biggest yet with over 90 people! The trip was similar to the others but with many more smiles, a private lunch and a visit from Rapunzel (see our video for her dancing with a tiny Rapunzel (also known as Pal Ebonie!)). It was an amazing end to 3 weekends of fun and we thought instead of telling you the details we would share some videos instead! Don’t forget to read the write up about trip 1 and 2 though. This is a tiny selection of pictures from feeding Sea lions and meeting lots of different animals. Finally a video of some of the many happy times! We started this project after we were offered corporate support, after jumping through lots of hoops though, the company changed their mind leaving us with a project costing over 3 times our annual income and a lot of excited families. At times this seemed like it would be impossible, but in the end 50 families had an amazing weekend! It was meant to be one trip which turned into 3 and, guess what, there is a part 4 planned! A Christmas weekend for those who were too ill to attend before or who are facing their last Christmas together, for details please see here. We couldn’t possibly begin to thank everyone on here who helped, fundraised, donated or cheered us on but we would like to say a big thank you to Merlin’s Magic Wand and the staff at Chessington World of Adventures who went above and beyond. Lots of planning with Chessington went into the trip and families commented on how the tiny details, like having the correct amount of extension leads for their child’s equipment in rooms or catering to special diets, made it a relaxing time. Big thank you in particular to Nikki, Von and Grant. Thank you to Dawn, Steve and Jaymee who gave up 3 weekends and did lots of running about. Extra Smiles Sarah who put so much work into securing funding for individual families and for the countless hours that went into this project, it would not have happened without her. Dawn Smith for running 2 online auctions and raising lots of money, thank you also to everyone who donated an item or placed a bid. Elbi and all your users, clicking the love button really does add up and paid for a few families to attend! I’m sorry to everyone we haven’t mentioned but we appreciate all your help and we hope you enjoy seeing the happy memories you helped create. 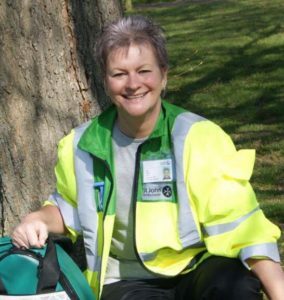 Sadly recently Jan passed away after a long battle with cancer. Jan volunteered to be our treasurer back when Post Pals was a small non profit organisation. We were unable to raise the £5000 annual income you need to become a registered charity and we were stuck in a cycle where not being a reg charity made fundraising even more difficult. Jan came onboard, helped raise the money and got Post Pals very very organised! Post Pals held a one off party for our 5th year but following it Jan offered use of her house and garden. For the next 2 years we held it there until we were big enough to move to a venue and it became an annual event. Jan did so much background work for Post Pals, covering a range of things from dealing with Paypal (you wouldn’t believe the hours it required!) to arranging a special wish- a kitten (a breed most suited for disabled children, insurance and vaccinations) for Seraphina! Post Pals would definitely not be the charity it is today if it wasn’t for Jan! We will always be grateful and her hard work lives on in the smiles created every day by Post Pals. Post Pals is launching its Christmas schemes, bringing some smiles and magic to seriously ill children and their families. We have several schemes – with options for individuals, schools, groups and companies to get involved – most of which will only cost you a stamp! They range from putting together a ‘shoebox’ style gift, to using your imagination. Reindeer Scheme- You are assigned a family to send 9 cards to during the month of December; one from each reindeer talking about life at the North Pole and the preparations for the big night! Mrs Claus Scheme– Similar to the Reindeer scheme, you are assigned a family and send a letter from Mrs Claus. You can talk about anything from what Father Christmas is doing to sharing your favourite cookie recipe. Elf Scheme- You are assigned either a seriously ill child or their sibling and put together a box of gifts. These don’t have to cost much, it’s the thought that counts! We give a guide price of £15 although some people choose to spend more and others less. Company/school/group Scheme- You are assigned a family and go about making their Christmas special! How you do this is up to you, be it little gifts, cards, messages, organising or funding a treat (like a cinema trip), video messages etc. Your only limitation is your imagination! Of course, being a charity that sends cards, letter and gifts all year around, we also welcome anyone sending a Christmas card, decoration, handmade item or gift. It’s a great way to use up the extra few cards left in a pack or the 3rd gift on ‘buy 2 get the 3rd free’ offers stores often have. You can select any child from our Find Pals page and send with no commitment or need to notify us. To be assigned a child for one of the schemes please email assignedprojects@postpals.co.uk Please tell all your friends and family about our schemes, together we can help spread some Christmas magic!